Le Chic was previously known as SD le Chic, but although the name changed, its spirit remained untouched. Le Chic is a luxury fashion brand whose origin traces to Netherlands. The brand produces exclusive clothing and accessories specifically for girls. The clothes offered by the trademark are stylish and edgy, while the palette of colors is monochrome including grey, pink and navy blue. The designs of clothes are chic and elegant added with a slightly vintage style. Le Chic is widely known across Europe for its traditional style and durability of clothing produced. The kids’ wear of the brand is characterized by extreme luxury to make every little girl look elegant and sophisticated. The brand was founded in Netherlands and uses traditional techniques of its country of origin. The overall image produced by the brand’s collections is characterized as a bit old-fashioned as the brand’s designers adhere to the local traditions and craftsmanship during the production of kids’ wear. The classic elements of style are mixed with innovativeness although the latter is not so obvious. Basically, the brand uses traditional aspects of craftsmanship to produce elegant and chic clothing for young girls of different age groups. 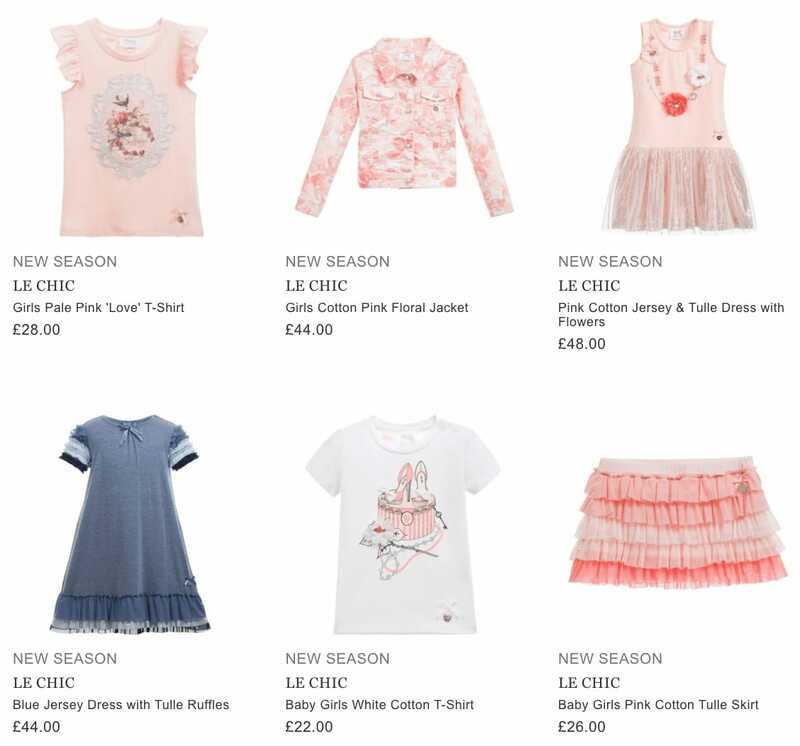 If you want your girl to look like a modern-day princess, check out the collections of Le Chic and you are sure to find a number of suitable outfits for your precious one. We advise you to pay attention to the collection of dresses offered by the trademark. These items of girls’ wear can be matched with a cardigan and a skirt of the same style to ensure a perfect look of your little girl. The sizes of kids’ wear available in the collections of Le Chic are truly diverse ranging from toddler sizes to those intended for children aged up to eight years. It is also possible to match various items of clothing with an assortment of accessories offered by Le Chic to make your girl look even prettier and more elegant. You will never find anything similar to the creations of the brand as they are truly feminine and sophisticated. The dresses and other kinds of clothing are decorated with diamonds and studs which are a signature feature of the brand’s creations. A variety of designer dresses that can be found in the brand’s collections is produced from fun and trendy fabrics that are soft to the touch and extremely delicate. Le Chic ensures an original look of every little girl. Its clothing is 100% authentic due to the careful selection of fabrics and close attention to every detail. The finishing of every piece of clothing is characterized by edginess and unforgettable style. Your girl will absolutely adore wearing the creations of Le Chic due to the elegance they provide to the wearer. Check out the fabulous collection of the brand’s clothes and accessories to find some truly sophisticated items of kids’ wear for your precious one. The clothes of the brand represent a perfect gift for little princesses who always want to look their best disregarding the event. Le Chic clothing is suitable for wearing at special events in the life of your child and on everyday basis likewise. For this reason, the collections of the brand represent a universal variety of clothes that your child will most definitely fall in love with. Nowadays, the collections of Le Chic can be purchased not only in luxury fashion boutiques of its country of origin, but in many other corners of the world as well as in online stores where you can buy anything you wish for a highly reasonable price. Don’t hesitate to look through the superb variety of girls’ wear by Le Chic!